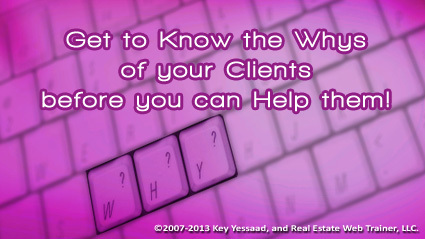 Without a clear understanding of ‘Why’ a Property Owner is selling their home your Marketing will fail. Experienced Agents will tell you that the ‘reason for selling’ will reveal not only the motivation of the Property Owner, but also the time you have to do your job. The National Median Days on Market is between 70 and 100 Days and since 95% of all properties go through at least one price reduction, it means that you have 3 months to have a strong Marketing Strategy, but most importantly a Skilled Pricing Strategy. There is, and always will be, a gap between what Property Owners view as the value of their Property, versus the reality of what the market will bear; and this is why you are the Real Estate Professional. You will not be able to do your job until you clearly delve into understanding why the Seller wants to sell; you need to find a way of bringing up the topic cleverly several times during your presentation; you want to get to know what their future plans are; and even find a way of having them share what they plan on doing with the money once the closing occurs. This next statement will shock a few of you but your Sellers do NOT tell you everything, they even, in some occasions, will lie to you – you see they have construed in their mind that if they tell you they must sell, that you will under-price their property.